NY-23 Voting Hack — It was claimed that voting machines used in the New York 23rd District congressional race had a computer virus. The claim has since been rebutted. The race appears to have been won by Democrat Bill Owens albeit absentee votes are still being counted. Second place finisher Conservative Doug Hoffman conceded on Election Night after being given erroneous vote tallies. The Republican, Dede Scozzafava, finished a distant third and ended up endorsing the Democrat. The votes that went to her would have easily put Hoffman over the top. And I really don’t think these machines were hooked up to the internet or receiving emails. Bill Clinton Wins — I neglected to note last week that Democrat Bill Clinton held up to the Republican tide and beat Tracy Barusevicius 328 to 228 to hold his 1st District seat on Upper Providence Council, Delaware County, Pa.
As in the states with races getting national coverage Election Day was a Republican Day in Pennsylvania — and especially Delaware County. According to unofficial results, Republican Joan Orie Melvin was leading Democrat Jack Panella, 898,453 votes to 796,470 votes for the state Supreme Court seat with 97.4 percent of the precincts reporting. Also, Republicans Sallie Mundy, Paula Ott and Judy Olson seemed to have wrapped up places on the Superior Court along with Anne E. Lazarus, the lone Democratic bright spot. In fact, the fourth Republican, Temp Smith, also finished behind Democrats Robert J. Colville, and Kevin Frances McCarthy. Republicans Patricia A. McCullough and Kevin Brobson won the races for Commonwealth Court. In Delaware County, Republican Linda Cartisano beat Democrat Nancy Rhoads Koons for a seat on Common Pleas Court in a 53,116 vote to 34,060 vote landslide. Republicans Jack Whelan and Mario J. Civera beat Democrats Keith Collins and Nancy Baulis by similar margins for County Council seats. In Springfield, Republicans Gina Sage, Paul Wechsler and James J. Devenney easily won their commissioner races. In a non-partisan election, Superior Court Judge Kate Ford Elliott and Commonwealth Court Judge Dan Pellegrini were retained by 68 percent and 66 percent votes respectively. I’m sure many of the Democrats listed below are fine people and I understand that maybe some of the Republicans may not be, but I’m touching the GOP party-line button. Gotta love the hope and change. Tomorrow is Election Day and while the races are not high-profile they are still important. Perhaps the most so is the battle to fill the state Supreme Court seat being vacated by Jane Cutler Greenspan who was appointed to complete the term of the late Chief Justice Ralph Cappy after he retired last year. She had agreed not to seek a full 10-year term. The race is between Joan Orie Melvin, a Republican from Pittsburgh, and Jack Panella, a Democrat from Bethlehem. Both are sitting Superior Court judges. While judges are supposed to be non-partisan, the winner will provide a one-vote majority on the court to his or her respective party. And for state Superior Court — the 15-member body which is the first stop for most appeals for criminal and civil cases from the county-based Courts of Common Pleas — nine candidates are chasing four seats. The candidates are Republicans Sallie Mundy, Paula Ott, Judy Olson and Temp Smith; Democrats Anne E. Lazarus, Robert J. Colville, Kevin Frances McCarthy and Theresa Samina; and Libertarian Marakay J. Rogers. The term is for 10 years. For state Commonwealth Courth — the nine-member body that handles appeals regarding matters involving state and local government and regulatory agencies — Republicans Patricia A. McCullough and Kevin Brobson, and Democrats Linda S. Judson and Barbara Behrend Ernsberger are chasing two seats. The term is for 10 years. Seeking election to a 10-year term on Delaware County Common Pleas Court are Republican Linda Cartisano and Democrat Nancy Rhoads Koons. And after the 10 years are up, the judge does not stand for contested election but for a retention vote in which the only options are yes and no. Standing for retention elections this year are Superior Court Judge Kate Ford Elliott and Commonwealth Court Judge Dan Pellegrini. The only contested Magisterial District Court race in Delaware County is in District 32-1-31 in Eddystone Borough between Republican Philip Turner Jr. and Democrat Alan Davis. Four persons are seeking two seats on County Council — Democrats Keith Collins and Nancy Baulis, and Republicans Jack Whelan and Mario J. Civera. Joseph McGinn, Edward O’Lone and Hugh Donaghue are not contested for the offices of Sheriff, Controller and Register of Wills, respectively. Domenic Bentivegna, Region 1; Theresa Carlson, Region 2; Douglas E. Carney, Region 3; Keith R. Black, Region 4; and Donald L. Heller, Region 8; are uncontested for seats on the Springfield School Board. Democrat Scott Newman in Ward 4; and Republican James J. Devenney faces Democrat Michael Kellar in Ward 6. Running uncontested for Auditor is Republican James T. Delizzio; Constable, Republican Christpher Eiserman and cross-filed Shawn Riley; and Treasurer cross-filed Margaret A. Young. A good source for more details and other races is the League of Women Voters of Delaware County’s Smartvoter.org. The local races can be followed online at this page on the county’s website. The state races can be followed at this page at the Pennsylvania Department of State’s website. 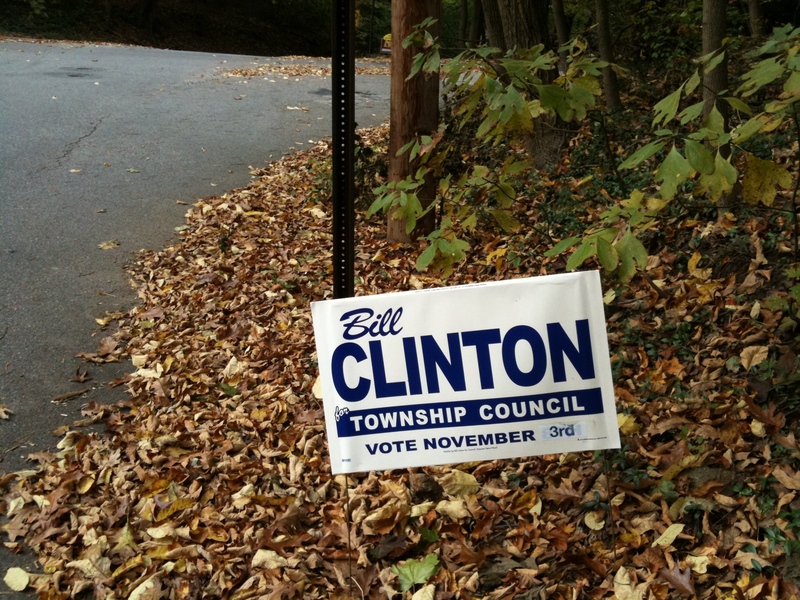 Bill Clinton For Township Council — Actually, though too a Democrat this one doesn’t have any scandals associated with him. He’s the incumbent being challenged by Tracy Barusevicius to represent the First District of Upper Providence Township, Delaware County, Pa. The photo was taken on Manchester Avenue just south of the Pennsylvania Institute of Technology.